Grand Mesa, CO – It might have been the only chance in decades to ski the Grand Mesa Thunderbird, my life-long passion which almost no one else seemed to share. I’d end up skiing the couloir face first, sans skis and wrapped in an avalanche. 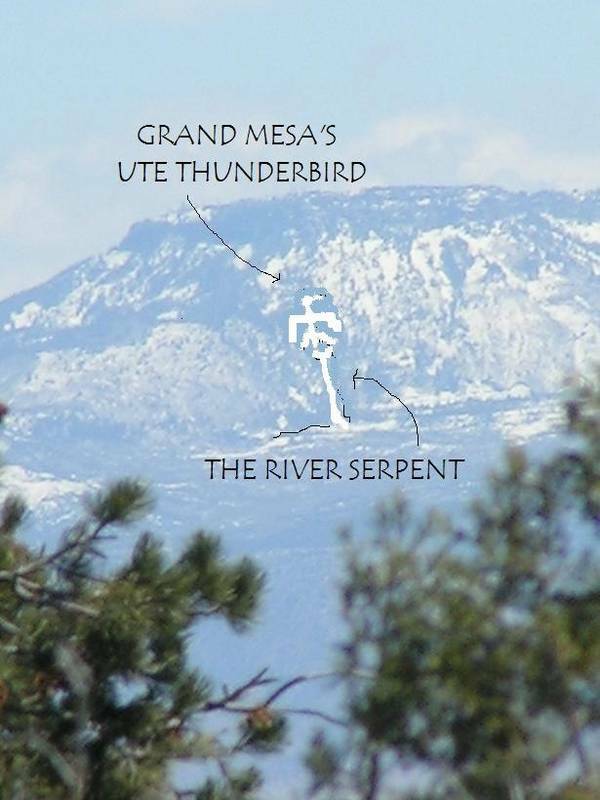 The Grand Mesa is not a mountaineer’s typical query, but the North Turret has merit — if not for its rugged shape and local proximity, then for the Ute legend of the Thunderbird played out in hieroglyphic form on its steep slopes. The local Utes believed the light-colored shale appeared as a wing-spread Thunderbird grabbing a long, skinny serpent-like chute rarely visible from below. When a coming storm’s light shows the Thunderbird grab the Serpent, it rains in the valley. I have witnessed this just once, in 1992. The author’s enhanced photo depicting the Thunderbird Couloir on Grand Mesa, Colo.
I’ve looked up at the Thunderbird Couloir with wonder before I even knew its name. I longed to view, hike, and perhaps even ski it up close. My brother, Dirk, and I scrambled up the Thunderbird route in September 2009 and found it enjoyable but a “bushwacky” climb above and below. Having an indomitable thirst for intriguing and hard-won ski routes, Ann Driggers, president and CEO of the Grand Junction Economic Partnership, was fired up to go with me after years of mentioning it. Ann and I left Rapid Creek Trailhead at 5 a.m. on March 17, 2010. Hiking along the dark road until we reached snow cover at about 6,000 feet, wee put skins on our ski bases and schussed upward, crossing a meadow and entering thick, low-slung brambles. The dawning sun broke upon the glowing Book Cliffs below as we bobbed and weaved through snags of oak brush. We stepped onward to the bottom of the narrow Serpent Chute. We fixed skis to our packs, crawling and kick-stepping up the barely covered Serpent Chute to the wider Thunderbird Couloir above. Reaching the crest, we paused for a break, deciding that the west-facing Couloir had not yet received enough sun to soften it from its hardened overnight state as we continued steeply skinning toward the basalt-capped summit. I spied a possible scrambling route to try at a later date. We beamed from enjoying the great mountain climbing experience that was within view and reach of our homes. The author prepares for his fateful entry to the Thunderbird Couloir. At about 11:30 a.m., Ann and I skied down to the head of the great bird. I followed Ann skier’s left out onto the sharp beak. We skied to center, then left again on mostly icy snow. I decided to ski back into the Serpent’s gullet, dropping over a rocky knoll into an open snow patch. The rough textured snow cracked, rumbled and dialed open like a 3-D puzzle. “No! Stop, Ann!” I yelled behind me. I tried to force a turn to get out of the slide but was immediately sucked under the snow. As I was screaming face down, snow chunks and loose powder surrounded my entire being. It was exactly as I had envisioned being in an avalanche, only rougher. I saw myself sliding quickly to my burial, suffocating and freezing solid in cement-like snow. I tried to swim and kick to the surface and get my feet pointed down. The snow pounded my face into the rock and debris. I persisted — just as the slide caught air and I was freed to put my now ski-less backcountry boots below me. I was surrounded by snow and launched off of an abrupt drop. I hit hard and my legs crumpled. The thickened snow slammed me without pause and bludgeoned me blindly through hard trees and over two smaller drops. The trees grew denser. I was spit out by the tumbling snow and slid in slow motion onto a sloping ledge. I clung to a slender tree suspending me above another 80-foot drop. I was relieved to not be buried and able to breathe. I was horrified when my legs did not move with my body. I was in shock and yelled for Ann to find me. “Are you OK, Seth? !” she shouted back. “I’m HERE!” I called in response. Blood dribbled past my eyes and onto my phone as I dialed 911. 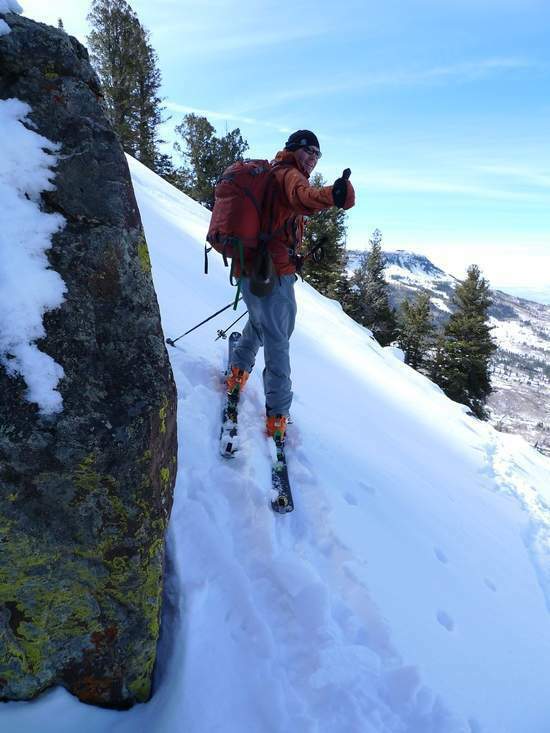 “I am on the west face of Grand Mesa on the north side of Rapid Creek just above Palisade. I’ve just been in an avalanche-triggered fall on the Thunderbird Couloir,” I said, trying to stay calm. Ann skied up next to me on the ledge, “Oh my God, Seth, are you OK?” I repositioned my crushed legs uphill to slow my bleeding and handed her my phone. My cell phone signal was gone, so Ann managed the rescue effort with calming strength. Just after 1 p.m. Ann called 9-1-1 and coordinated with Mesa County Search and Rescue and Powderhorn Ski Patrol’s Rondo Beucheler, who is also the owner of Palisade’s Rapid Creek Cycles and knows the area better than most. My pack and skis were gone, and I was covered only by my uninsulated Loki shell as I shivered — immobile, contemplating the blood that was once soft inside my legs, but now stiffening into huge and painful trunks to compensate for lack of solid bone structure. I suggested that I should wrap a belt tightly at least around my left leg, which was broken at the femur and swelling more dramatically. Beucheler insisted that we not try it if it wasn’t bleeding through. Ann handed me her light down jacket as she improvised a platform and prepared for the rescuers to arrive. Around 4 p.m., the rotating blades of the St. Mary’s Careflight helicopter pounded the air and searched for a safe place below us upon which to land. Pilot Bill Reed landed Search and Rescue’s Jose Iglesias, Joanne Black and flight nurses Tom Feller and Rob Klimek to climb up to our ledge. They set up IV fluid and painkillers, essentially to save me. By now the shock had worn off and I was in serious, sometimes vocal pain. I was elated to have Sanadam, Rich Moody, Bob Marquis, Terry and many more search and rescue members be so calming and strong. They made me want to live beyond the delicate thoughts of my new son, Asa, and loving family. The IV fluid, however, was my nemesis. I wanted so badly some water to moisten my throat but I was only allowed to eat snow. Sensible for surgery… I wasn’t sure I could hold together for the hospital. Many more well-spirited and strong search and rescue members arrived to help. I was soon strapped to a rescue basket and rappelled down the initial drop. We trudged across several more stepped slopes to one more rope lowering to the waiting helicopter. By sunset I was delivered via rooftop landing to talented hands and openly kind souls in the new tower at St. Mary’s Hospital in nearby Grand Junction, Colo. Drs. Hilty, Narrod and Dolecki made lasting artwork of my near-fatal orthotic condition. I was saved by technology and intelligence, and yet nearly as much by the pure love I have received during my rescue and continuing recovery. I am eternally grateful for more than I could ever repay in my lifetime. It is as if I needed death in my face to realize how many great people I would miss and be letting down. Author Seth Anderson, who along with his brother Dirk co-owns the Loki apparel brand, spent six hours in surgery following his ordeal. He now sports a full length internal left femur and right tibia rods, two right fibula plates, 21 screws and two bolts holding his cracked left patella together. Two minor head lacerations are his only injuries above the belt. He’s currently receiving rehabilitation therapy, and tells his tale from a hospital room where he has remained since the March 17, 2010 incident.